Quick Post: I’ve never had roasted broccoli and have wanted to try it for some time. Broccoli was on sale today and I needed a “diet-friendly” side dish to go along with this tilapia and these mashed potatoes. These were so good – a little salty bite, savory, nutty a little sweet…so good. It’s my new favorite way to enjoy broccoli 🙂 Thanks for reading, enjoy! Cut the broccoli florets into bite size pieces. Cut the stalk into 1/8-inch thick, round slices. 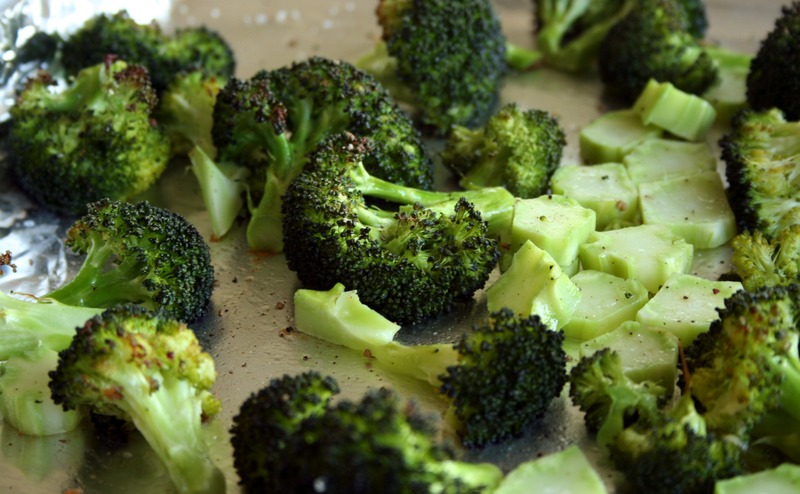 Place the broccoli into a mixing bowl and toss with the olive oil, kosher salt and pepper and spread out evenly on a baking sheet. Roast for 8 to 10 minutes.